There are about 4,590 students graduating yearly from a Nursing degree program in California with 26 colleges and universities offering the major. College students are going to pay prices around $20,998 and $345,008 in California to obtain their Nursing degree. Starting salaries of $53,333 and mid-career salaries of $70,116 are normal for a Nursing graduate. 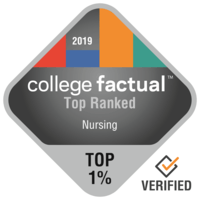 View the rankings below to find out what college offers the very best degree program for Nursing students. Next you will find the top universities and colleges in California for studying Nursing. Our ranking methodology includes only California colleges and universities and evaluates them based on aspects like average salaries of graduates, accreditation, educational quality, and more. It is hard to beat Azusa Pacific University if you wish to study Nursing. At Azusa Pacific University, nursing learners enjoy the benefit of a really focused program. Situated in Azusa, California, Azusa Pacific offers a comfortable, suburban atmosphere for young people. Applicants shouldn't let affordability concerns prevent them from applying to Azusa Pacific University as 93.0% of undergraduates get some sort of financial aid. Azusa Pacific is dedicated to helping students succeed, as evidenced by its 51.2% four-year graduation rate. If you're interested in learning more, you will find every one of Azusa Pacific University's rankings here. It's hard to find a better school than University of California - Los Angeles if you wish to pursue Nursing as a major. In addition to its bachelor's programs, University of California - Los Angeles offers graduate degrees in Nursing. Los Angeles, California is the perfect surrounding for college students who like the active city life. Worried about student debt? (We don't blame you!) this school and its $23,423 annual net price may be a great match for you. This school does not require freshman students to live on-campus. For more info, look at college scorecard. University of San Francisco is one of the finest schools in the United States for Nursing. In addition to its bachelor's programs, University of San Francisco offers graduate degrees in Nursing. Positioned in San Francisco, California, this college is a sound final choice for students who enjoy the joy of a substantial city. In America, only 37.0% of students graduate on time. USFCA is way ahead of the pack on that mark with a 61.6% on-time graduation rate. 86.0% of freshmen return for their second year of school. For more info, check out the college scorecard. Any student who is interested in Nursing has to look into Mount Saint Mary's University. Mount Saint Mary's University offers graduate degrees in nursing for those interested in an advanced degree. Situated in Los Angeles, California, this university is optimum for individuals who thrive in an urban setting. Top quality education for veterans and military members has earned Mount Saint Mary's University top marks. 79.0% of first-year students come back for their second year. The scorecard provides a great summary of MSMU. San Diego State University is among your best bets if you're planning on studying Nursing. Nursing majors from San Diego State University earn a boost of around 20.2% above the average earnings of nursing graduates. Looking for a big school? This college has more than 20,000 students on campus. Around 55.0% of applicants send ACT scores, with the typical score in the 26 range. San Diego State University's rate of student loan default of 3.6% is considerably below the national average of 7.0%. Want to learn more about San Diego State University's campus? Have a virtual tour. Point Loma Nazarene University is a great option for individuals interested in a Nursing major. Point Loma Nazarene University nursing students receive 10.1% more than the typical nursing student. The surrounding area of a significant urban center is tremendous for young people trying to find adequate chances for social networking, experience, and life. Parents, you will be happy to find out Point Loma Nazarene University features a relatively low crime rate. With the diverse campus at PLNU, you will have plenty of opportunities to meet individuals from many backgrounds. The scorecard provides a good summary of Point Loma Nazarene University. It is hard to find a better school than University of California - Irvine if you wish to study Nursing. University of California - Irvine nursing students receive 13.1% more than the standard nursing grad. With over 20,000 undergraduates, University of California - Irvine is among the largest schools in the nation. You'll be able to meet others from many different ethnicities thanks to UC Irvine's diverse student body. You shouldn't be concerned about affording University of California - Irvine; 68.0% of their undergraduates obtain financial assistance. A virtual tour is a good way to find out more about University of California - Irvine. It is hard to beat California State University - Long Beach if you wish to study Nursing. California State University - Long Beach offers graduate degrees in nursing for those interested in an advanced degree. Long Beach, California is the perfect surrounding for young people who get pleasure from the fast moving city life. California State University - Long Beach does not require freshmen to live on-campus. The campus at California State University - Long Beach is extremely diverse and includes undergraduates from over 21 U.S. states and 47 nations around the world. A virtual tour may be a great way to explore California State University - Long Beach. San Jose State University is a great option for individuals interested in a Nursing major. San Jose State University offers graduate degrees in nursing for those interested in an advanced degree. This school is among the largest schools in California. Graduates from San Jose State University are doing well in their jobs as they're much less prone to go into default on their loans compared to grads of other colleges. On average, students take on about $22,600 of student loans at San Jose State University. That's lower than the national average of $28,421. The scorecard will give you a fantastic summary of San Jose State. San Francisco State University is among your best bets if you're planning on studying Nursing. San Francisco State University offers graduate degrees in nursing for those interested in an advanced degree. With over 20,000 undergraduates, San Francisco State University is among the biggest schools in the U.S.. This institution features a superior freshman retention rate, with 80.0% of first-year students returning the next year. Worried about student loans? (We understand!) San Francisco State University and its $21,819 annual net price could be a good match for you. The scorecard provides a good overview of San Francisco State University.